YOUR voice and vote matter. Speak up and be heard! Today is a big day in the United States. You, yes fabulous you, get to help decide who represents your interests in government. Perhaps you already have plans for this evening to watch the national and local results. You likely have hopes of celebration, as do we. Tomorrow, there will be some people jumping for joy and others may feel like throat punching something. If that happens to be you, of course- we encourage you NOT to actually throat punch anything. But you can lightly satisfy that urge by donating to and volunteering your time to the causes that are most important to you. It’s important to know that whatever happens, this is not the end. There is work to do, bridges to build, communities to help, and forward movement in all areas of the cannabis industry. Eyes on the horizon- lots more work to do! 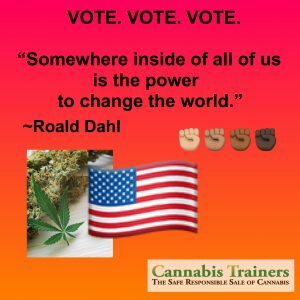 If you are a member of National Cannabis Industry Association, join their webinar on November 8th: Post-Election Cannabis Policy Debrief. Thank YOU for voting for what matters most to you.